Steel salvaged from the wreckage of the World Trade Center in New York has been sent to a Mississippi shipyard to be used in the construction of a new US warship. The metal was taken from the Fresh Kills landfill in New York, where the debris of the twin towers was dumped after they collapsed in last year's 11 September attacks. According to reports, a massive structural beam which supported the south tower will be used to build USS New York, an amphibious vessel capable of carrying more than 1,000 soldiers. The recycling for profit of metal from the twin towers, where nearly 3,000 people lost their lives, has proved to be process fraught with emotion and controversy. But New York Governor George Pataki said he was proud that the remains of the tower would be used and pleased that the vessel would be named in honour of those who died. ''The USS New York will soon be defending freedom and combating terrorism around the globe, while also ensuring that the world never forgets the evil attacks of 11 September and the courage and strength New Yorkers showed in response to terror." Steel from the site has already been sold around the world. 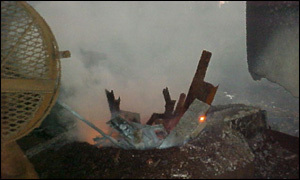 Almost immediately after 11 September, New York authorities started looking for ways to deal with the 1.6 million tons of wreckage. After investigators combed through it, extracting human remains and personal effects, more than 350,000 tons was sold for recycling in China, Malaysia, Korea and India. The World Trade Center steel was thought to be some of the heaviest, thickest steel ever used in construction. Its outer skeleton comprised of steel beams up to two feet thick. Industry experts estimate that the steel has been sold to recyclers for between $75 to $100 a ton, but it is unclear whether the Navy will pay for the scrap it is using to construct the warship. The USS New York should be ready for active service by 2007. Did media get it right?